Boswellia, also known as Indian frankincense, is a traditional treatment for joint and back pain, arthritis, asthma, sports injuries, ulcerative colitis and even Crohn's disease. A study published in the January 2003 edition of “Phytomedicine” found that boswellia decreased pain in patients with osteoarthritis in the knee, and researchers also recommended the herb for treating other types of arthritis. The resin harvested from the plant provides the most medicinal benefit, and natural healers often prescribe the substance in capsule or tablet form for treating a variety of ailments. Dosages vary, however, depending on the condition being treated and the standardization of the product. Take 600 to 900 milligrams of boswellia standardized to contain 60 to 65 percent boswellic acid, the herb's active ingredient, as a general dosage. Three to four capsules of boswellia extract typically contain the recommended amount of acids. Take 300 milligrams of boswellia in capsule form up to three times per day for treating arthritis, asthma, chronic pain, Crohn's disease and sports injuries. This is the standard dosage for these ailments recommended by Whole Health MD. Take 300 milligrams of boswellia standardized to contain 40 to 65 percent boswellic acid up to three times per day to treat chronic back pain, or rub a pea-sized amount of boswellia cream into the affected area once every 4 to 6 hours as needed. 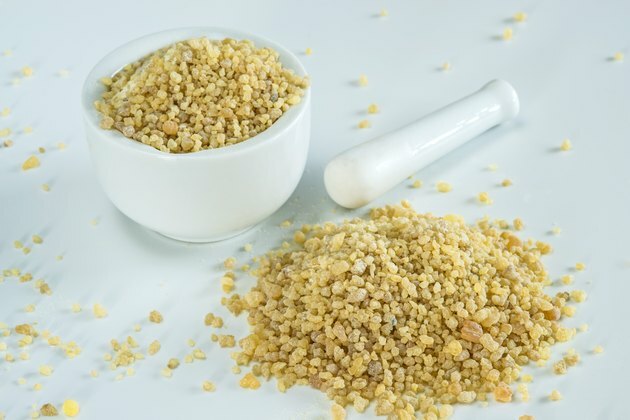 Take dried boswellia resin if you cannot find a standardized extract. In his book “The Essential Guide to Herbal Safety,” Simon Mills recommends taking 2 to 9 grams of the resin per day, which is equivalent to the standard extract dosage. Cease taking boswellia after 8 to 12 weeks. The safety of taking the herb internally for longer periods is currently unknown. Boswellia topical cream used for pain relief may be taken indefinitely with no adverse side effects. Take boswellia extract for treating inflammatory joint conditions only under the supervision of a doctor. If symptoms worsen, seek immediate medical attention. Although generally considered safe when taken as directed, boswellia may produce side effects on rare occasions including nausea, diarrhea and skin irritation.